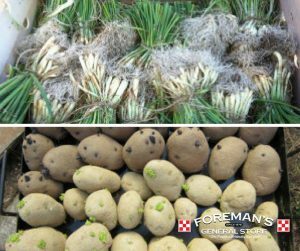 Spring onion slips and seed potatoes are in now at Foreman’s General Store! Now is the time to get your spring onions and potatoes in the ground. Browse our Onion Sets and Seed Potatoes. Choose from Texas 1015, White Granex, Yellow Granex and Red Burgundy onions at $1.99 per bunch. Burgundy – A good dark red-skinned table onion with mild, sweet white flesh. Granex — One of the Deep South’s most popular onions, the large, yellow bulbs may be thick-flat or almost globed. It’s an early variety, and it keeps well if cured and stored properly. Granex, also known as the Vidalia onion, comes in red and white varieties. Texas Grano 1015Y – A new strain of ‘Yellow Grano’ with a sweet, mild flavor and better-storing ability and disease resistance than other Texas Granos. Walla Walla – The pride of Washington state, this globe-shaped onion is exceptionally mild and makes jumbo- to colossal-sized bulbs with light brown skin and pretty white flesh. Sweetest of all the long-day varieties, it is the only onion coming close to the sweetness of Georgia Sweet. Exceptionally mild flavor. Will keep for a month. Seed potatoes include Yukon Gold, Red La Soda, and White Kennebec potatoes at 99¢ per lb. Red Lasoda are a high yielding variety. Resistant to tipburn, and to wind, heat and drought damage. Very early variety that has high tolerance of heat, plants do not wither during heat and drought. Beautiful smooth red skin with pure white flesh. Tubers are oblong and slightly flattened with medium deep eyes. An excellent potato for boiling, never loses its flavor. Known as the best storing red potato, will keep for months. Yukon Gold are a medium to high yielding variety. Excellent storability. Long dormancy period. Plant these in your garden and you will have a goldmine of yellow-skinned, yellow-fleshed potatoes ready to harvest in 100 days. Potatoes are perfect for browning or your favorite recipe. White Kennebec is a hefty potato with an ovate to oblong shape and stouted ends. Its thin skin is layered with tones of creamy white and tan with a soft ivory flesh. The skin’s texture is semi-rough and speckled with shallow eyes. Its flesh is firm and moist, yet starchy, making it a versatile potato for culinary use. Kennebec potatoes have a rich, earthy and nutty flavor when cooked. Stop by Foreman’s General Store for all your gardening needs! This entry was posted on Monday, January 21st, 2019 at 4:12 pm	and is filed under News & Updates. You can follow any responses to this entry through the RSS 2.0 feed. Both comments and pings are currently closed.